The ultimate Visorak battle machine! Shatter even the strongest wall to rubble! Pulled by Visorak, this battle ram can smash though any obstacle the Toa Hordika put it in its way. 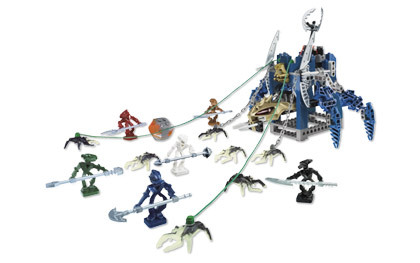 Combine it with #8759 Battle of Metru Nui to stage the ultimate BIONICLE® clash! Includes 7 mini Visorak figures and 6 mini Toa Hordika figures.